CORPUS CHRISTI, TX – One of the most valuable life lessons for any child (and adult) is how to play well with others and have fun. The Corpus Christi Parks & Recreation will offer two sports leagues this spring that are specially designed for children ages 3-5. The concepts of teamwork, sportsmanship, and having fun will be emphasized over winning for these leagues. They will provide structure and knowledge, as well as promote a lifestyle of recreational sports to youth at an early age. 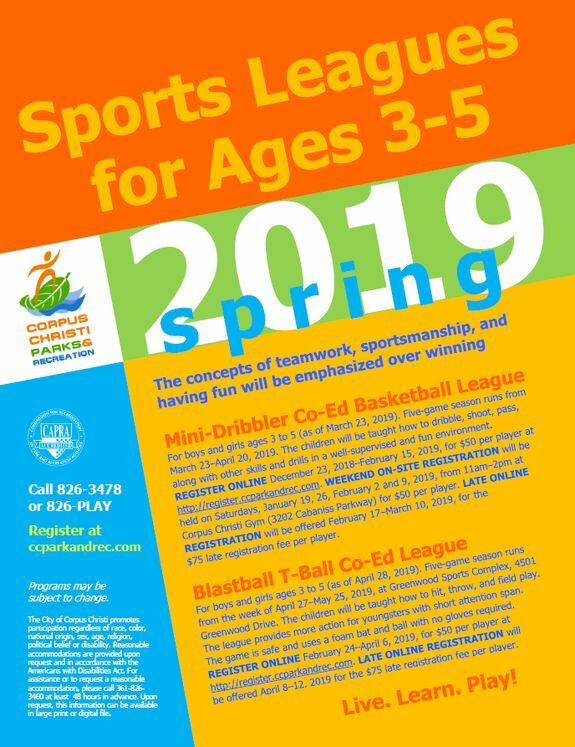 Spring 2019 Mini-Dribbler Co-Ed Basketball League: The Corpus Christi Parks & Recreation Department will offer this league for boys and girls ages 3 to 5 (as of March 23, 2019). The five-game season will run from March 23–April 20, 2019. The league is designed to introduce young children to the game of basketball through fundamental skills. Participants will learn how to dribble, shoot, pass, and other basketball skills and drills in a well-supervised and fun environment. REGISTER ONLINE December 23, 2018–February 15, 2019, for $50 per player at http://register.ccparkandrec.com. WEEKEND ON-SITE REGISTRATION will be held on Saturdays, January 19, 26, February 2 and 9, 2019, from 11am–2pm at Corpus Christi Gym (3202 Cabaniss Parkway) for $50 per player. LATE ONLINE REGISTRATION will be offered February 17–March 10, 2019, for the $75 late registration fee per player. Spring 2019 Blastball T-Ball Co-Ed League: The Corpus Christi Parks & Recreation Department will offer this league for boys and girls ages 3 to 5 (as of April 28, 2019). The five-game season will run from the week of April 27–May 25, 2019, at Greenwood Sports Complex, 4501 Greenwood Drive. The league is designed to introduce young children to the game of baseball and softball through fundamentals by teaching them how to hit, throw, and field while emphasizing the importance of teamwork and sportsmanship. It allows for more action for youngsters with short attention span. The game is safe and uses a foam bat and ball with no gloves required. REGISTER ONLINE February 24–April 6, 2019, for $50 per player at http://register.ccparkandrec.com. LATE ONLINE REGISTRATION will be offered April 8–12, 2019 for the $75 late registration fee per player. For more information about these leagues, call (361) 826-3478, or visit www.ccparkandrec.com (SPORTS).